Best headphones: which set should you buy? Best Headphones Buying Guide: Welcome to TechRadar's round-up of the best headphones you can buy on any budget in 2019. Everyone is unique, which is why everyone has their own, personal taste in music making it all the more important to be equipped with the perfect pair of headphones. Upgrading your headphones is a personal choice, but it's an essential step if you want to move away from the cheap earbuds that your phone probably came bundled with. But, since there are so many categories of music, there are just as many options when it comes to headphones. Some people like the convenience of a wireless set while others prefer the reliability and audio quality of wired headphones. Then there are those who want in-ear headphones, while the rest prefer over-ears. A better pair of headphones will add a new dimension to your music, whether it's more detail, added functionality or just more bass. It sounds like a lot. But that's why we have a guide for the best ones. The headphones that you'll find here have tons of features to help you get the most out of your music. 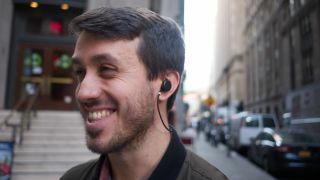 These features range from wireless connectivity to noise-cancellation and come in the three major form-factors: in-ear, on-ear and over-ear headphones. We've selected the best headphones for each form-factor, and we've even picked out a budget option for each so that you should be able to find an excellent pair, no matter where your price point lies. After spending a few weeks with the 1MORE Triple Driver in-ear headphones we were blown away at just how much value they give in this price range. It’s hard to think of a better sounding pair of headphones that are as durable. There’s very little with which we can find fault with but it's worth mentioning that the rubber cable is an unnecessary struggle and the remote control feels cheap because it's made of plastic without a metallic finish. But this is honestly just nitpicking. Instead, it's better to highlight the 1More Triple Driver's warm tonal balance. Even the bass sounds good with extension and impact. It gives you the right amount of boost without completely taking over. The Sennheiser CX 213's build upon the legendary budget in-ears, the CX 180, which have been around quite some time. Although it's a minimal upgrade when it comes to the CX 213's, the sound quality is balanced with a slight bass bump. Bass is slightly emphasized and features good impact while maintaining good control. It also has better passive noise cancellation to the table over the CX180. For your money, you can't do any better than Grado's SR60e. The third-generation of the Prestige Series is its best and most refined yet. The SR60e is a particularly smart choice if you're looking for an entry-level set of headphones that sound like they should cost you way more than they do. Its open-back ear cup design gives you a more breathable experience than what most on-ear headphones can deliver. In our candid opinion, it's the gold-standard when it comes to on-ears. Even though they have a plastic body, the AKG K92 stands as a very good competitor when it comes to audio quality. In most cases, you get what you pay for but these headphones push above and beyond their price range. They're dynamic, expressive and let you clearly listen to individual instruments without being reduced to a mess of sound. Most users prefer them for in-house use due to their size but being lightweight, portability is feasible. Their size is an asset rather than a drawback because their fit wouldn't be comfortable otherwise. All in all, their performance is amazing and they definitely give other brands a run for their money. If there’s anything surprising about the new Sony WH-1000XM3 it’s that they’re so consistent with what Sony has released in the last two years in the form of the Sony WH-1000XM2 and Sony MDR-1000X. To wit, they’re a dominant noise-cancelling pair of headphones that can beat out anything Bose has with both arms behind its back. Beyond being exceptional at keeping external noises at bay, Sony's headphones are Hi-Res Audio-ready, sporting aptX, aptX HD and LDAC codecs, plus offer will offer Google Assistant support right on-board. If you need a headphone that can live up to any challenge and excel in any environment, these are them. The Philips Fidelio NC1 replaces the Sony WH-H900N in our list. They come with two 1.5" Neodymium drivers and have a 3.9 ft cable. If you're looking for good travel headphones, they fit the bill with a hard case while folding in comfortably keeping them from being ruined when you throw them into your bag. The aluminium finishing gives them a premium look and subtle design, despite 'High Definition Audio Philips NC1' etchings on both sides. The headphones offer quality audio to the users while delivering 30 hours of battery life. Even if you choose not to use noise cancelling, the audio quality is amazing providing a balanced sound without forcibly favoring the bass. If you're on-the-go and don't want want to lug around massive headphones, this is the choice for you. If you're a frequent traveler you're probably all too familiar with headphones that can't hold a charge and can't block out sound, let alone sound very good. Let us introduce you to the Plantronics BackBeat Pro 2, one of the few headphones on the market that can do all of the above and cost less than half as much as one of the bigger names like Beats, Bose and Sony. They also include a neat little feature that allows them to automatically turn off when you're not wearing them, meaning you're able to easily maximise their battery life without much effort. Optoma NuForce BE6i are an updated version of the original NuForce BE6. However, the changes are minimal in the new pair of headphones. They come with 10mm dynamic drivers and eight hours of battery life, which is a bump up from the 6 hours that their predecessor offered. They have an aluminium enclosure for the drivers but it's paired with a sub-par plastic remote on their tangle resistant flat wire. They deliver good quality sound with controlled bass and decent clarity up top. The Optoma NuForce NE6i are a pair of no-huss, no-fuss headphones that can survive heavy use. Current page: Best headphones: which set should you buy? Next Page What else should you consider?